The Theodora building, now called The Mod, is on 35th Ave NE nearest to the corner of NE 68th Street. The (former) Theodora building in northeast Seattle, located on 35th Ave NE closest to the corner of NE 68th Street, went through a transition to new use and became a regular apartment building called The Mod in the year 2016. The Theodora began in 1914 as a home for widows, mothers and children, on land donated by Marvin & Isabella Jones. The Theodora was a three-story building where mothers and children could live together in their own room, and eat together at a table in the dining room. Childcare was provided so that mothers could find work. The Theodora Home later became low-income housing for senior citizens, operated by the Volunteers of America. 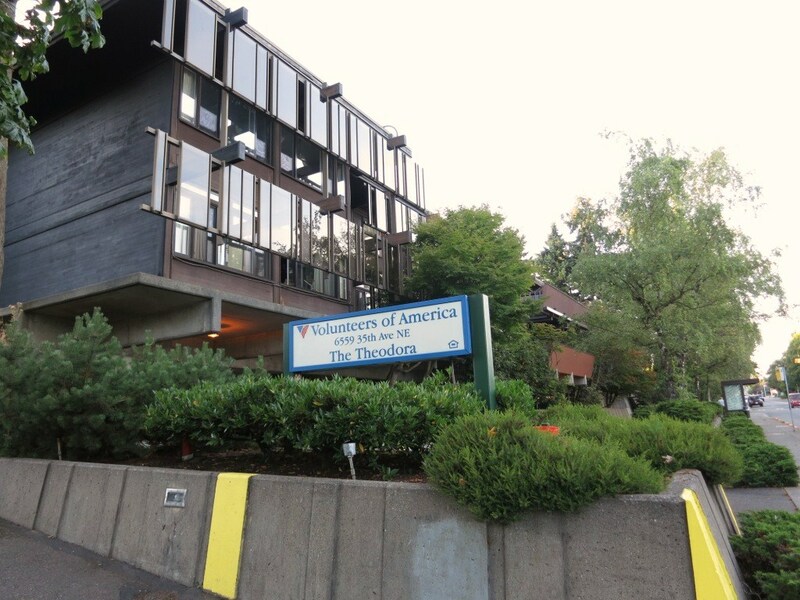 The Volunteers of America no longer operate housing in Seattle and they have consolidated their work in Snohomish County. Over several years’ time, the residents of the Theodora were helped to find other housing, and then the Theodora building was sold. The former Theodora Home is now an apartment building called The MOD. The Theodora, built in 1965, was sold to a private developer in 2015 who renovated the building, built an addition, and refurbished the exterior landscaping. The building was designated as a historic landmark under Seattle’s historic preservation program. The report describing the building and its design, can be read here. The Theodora (now called The MOD), built in 1965, was designed in an architectural style called Northwest Modern, with its use of exposed wood, overhanging roof and clean lines. The horizontal lines of the structure and its projecting form toward 35th Ave NE makes the building appear to float. The exterior includes stained wood, with strips of windows at the first and second floors, heavy timber beams that project from the building face at both floor levels, and a flat roof with projecting eaves. The Theodora is nestled in its site by plantings on all sides to give the feeling that the building is an organic element in harmony with its outdoor areas of trees and patios. The creation of indoor-outdoor living spaces is one of the style features of Northwest Modernist buildings. The Northeast Branch Library was built in 1953 in Northwest Modern architectural style. Along 35th Ave NE at the intersection of NE 68th Street the Theodora is adjacent to two other buildings by premier Northwest Modernist architects: the Northeast Branch Library (designed by Paul Thiry) and the University Unitarian Church (Paul Hayden Kirk). 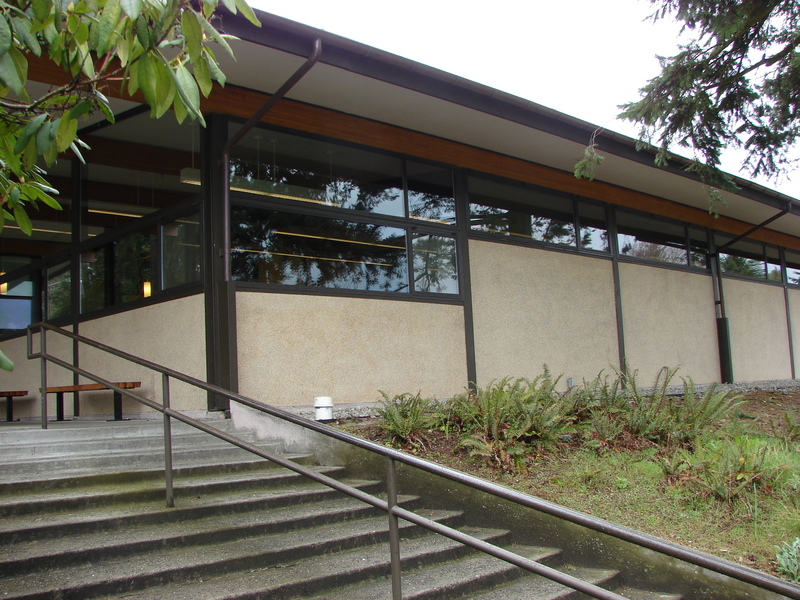 The Northeast Branch Library at 6801 35th Ave NE is the only other Northwest Modern structure along 35th Ave NE which has been designated in Seattle’s historic preservation program. The original architects of the Theodora were Grant, Copeland & Chervenak. In 1964 this firm designed the Forest Sciences Laboratory at the University of Washington in Seattle, with exposed wood beams and glass screens similar to those on the Theodora. At the June 17, 2015 meeting of the City of Seattle’s Landmarks Preservation Board the initial presentation, called nomination, was given by the Clark Design Group, the architects for the renovation of the Theodora. Portions of the Theodora which have been “landmarked” include the primary façade: the exterior along 35th Ave NE with its distinctive horizontal form, wood beam elements and contrasting glass screens. Some portions of the building’s interior were preserved by including them in the landmarking ordinance, including the atrium, fireplace and lounge. These areas were renovated, withgeometry and materials matching the original. Presentation by Clark Design Group at the City of Seattle Landmarks Preservation Board meeting on June 17, 2015. The side-entrance to the Theodora building on NE 68th Street was improved by pruning back the shrubbery and adding an accessible path up from the sidewalk. Within the guidelines of historic preservation, trees and landscaping were surveyed. Within the guidelines for historic preservation, the Theodora site itself with its plantings was reviewed by an arborist during the historic-review process, with exceptional trees marked for preservation and an overall site plan to refresh the landscaping, which had become overgrown. The proposed site plan included more lighting to be installed on walkways, patios and entries around the building on all four sides, and signage to mark entries. In 2015 the Clark Design Group applied for permits for construction at the Theodora, including interior renovations. The proposed construction of an addition at the south end of the property met with approval of its design both by the City of Seattle Landmarks Preservation Board, and by the City of Seattle’s Department of Planning & Development (DPD) for permitting. The modifications to the building and an addition were within the parameters allowed by the historic-landmarking process, matching the original Theodora in style and in scale. As of August 2016 the signboard told that the building now called The Mod was accepting reservations for the new apartments. The final step in the “landmarking” process for the Theodora building took place in 2015 with approval by City Council. Historic landmarking of the Theodora building allowed the addition of new buildings on the south end of the property. Landmarking does not restrict the naming of a building. As the Theodora has undergone remodelling into a “regular” apartment building, the new owners decided to rename it The MOD. Apartments began to be occupied as of the summer of 2016 in the completed portions of the building, while apartments in the additional, new building at the southern end of the property were still being completed. This entry was posted in apartments, Architecture and tagged historic landmarking, Neighborhood History, Northwest Modernism, Seattle. Bookmark the permalink.